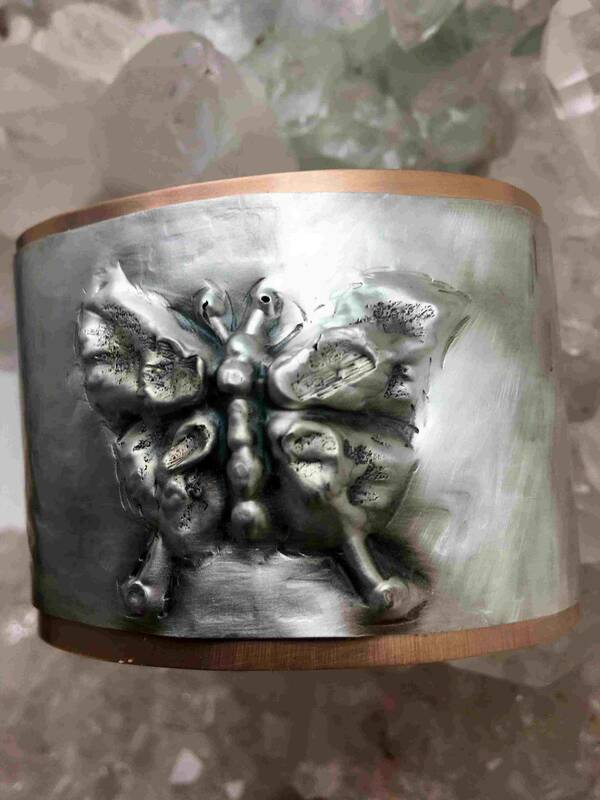 This lovely butterfly bracelet was made using the technique called Chasing and Repousse...using a hammer an small nail size tools to create the picture in metal. 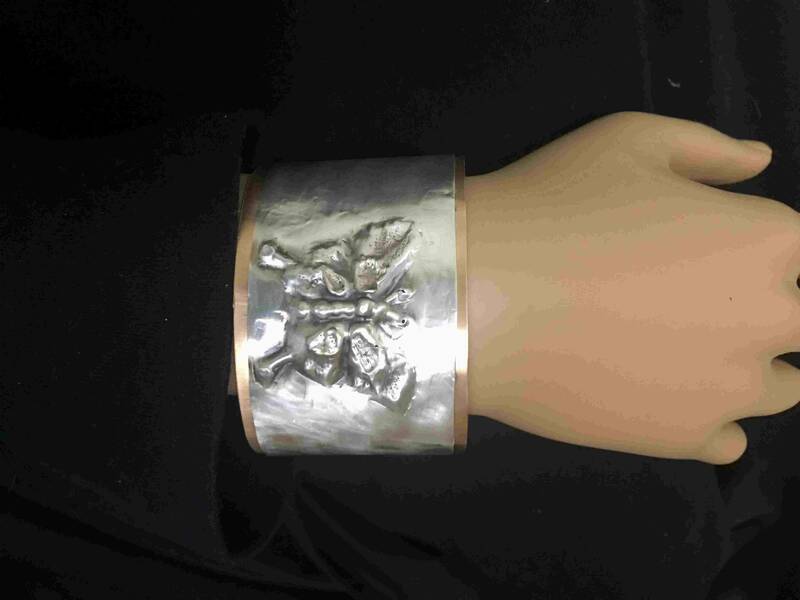 It is made of sterling silver, with bronze trim. Interpreting animal symbolism is a powerful way to connect with nature, and learn lessons from her creatures - lessons that we can apply to our own lives. Observing the butterfly and learning her symbolic meanings offers us an opportunity to apply her movements to our own lives. For example, we can relate the butterfly's stages of life to our own life-phases...growing pains, times of ravenous hunger, times of vulnerability, moments of miraculous expansion. The more we seek symbolism in nature, the more we realize we have a lot in common with animals, insects and life in the wild realms. Indeed, we are intimately connected with the animal queen/kingdom - inseparable from nature and her movements. Overwhelmingly, cultural myth and lore honor the butterfly as a symbol of transformation because of its impressive process of metamorphosis....from egg, to larvae (caterpillar), to pupa (the chrysalis or cocoon) and from the cocoon the butterfly emerges in her unfurling glory. What a massive amount of transition this tiny creature undergoes. Consider for a moment the kind of energy this expends. I daresay if a human were to go through this kind of change we'd freak out! Imagine the whole of your life changing to such an extreme you are unrecognizable at the end of the transformation. Mind you, this change takes place in a short span of about a month too (that's how long the butterfly life cycle is). Herein lies the deepest symbolic lesson of the butterfly. She asks us to accept the changes in our lives as casually as she does. The butterfly unquestioningly embraces the chances of her environment and her body. This unwavering acceptance of her metamorphosis is also symbolic of faith. 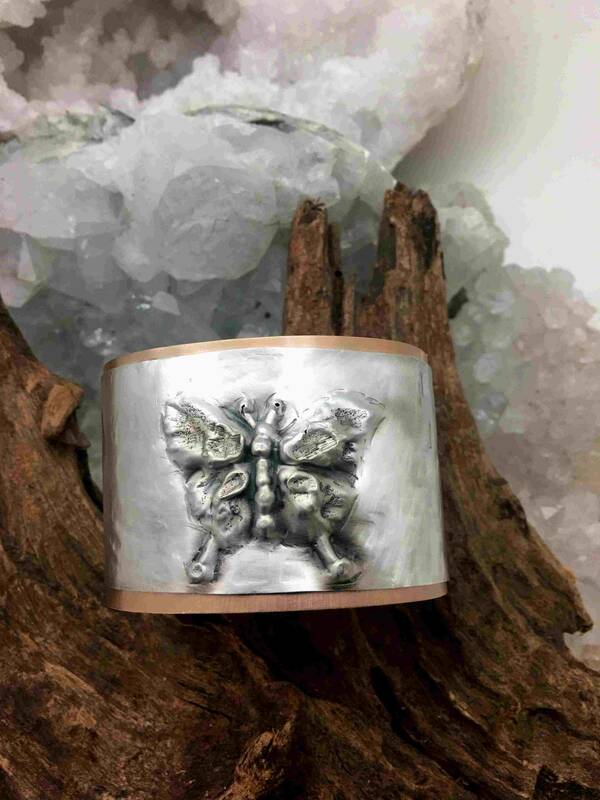 Here the butterfly beckons us to keep our faith as we undergo transitions in our lives. She understands that our toiling, fretting and anger are useless against the turning tides of nature - she asks us to recognize the same.